Run scheduled tasks when no user is logged on into the system | The official site of Advanced Task Scheduler software. Create your task on the "All Users" tab. Select the "Run task on the hidden desktop" option on the "User Account Options" tab of the Task Properties window. 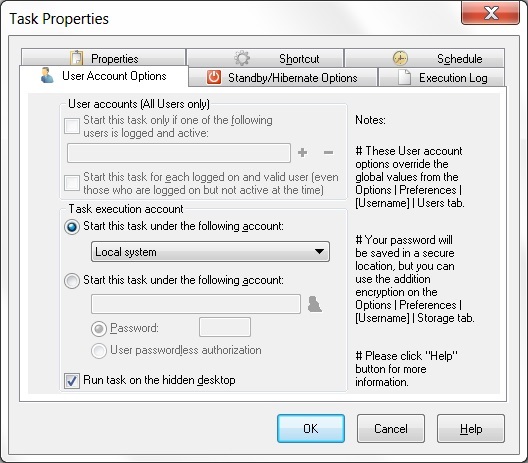 Select the user account under which the task will be executed in the "Task execution account" options on the same window. Active user and Local system - Local system (system account). Service user - Account under which the "Advanced Task Scheduler Service" is running (detailed in round brackets). Start task under the following account - a specified user account with it's user name and password. Use this option if your task has to run under a specific user account. Please note that if your task runs on All Users tab and uses a network drive, you may get Access Denied or similar error. In that case you need to change user account for Advanced Task Scheduler Service from LocalSystem to an administrator account. To change service account go to Control Panel | Administrative Tools | Services, double click Advanced Task Scheduler Service and specify user account on the Log On tab of the Service Properties window. Please make sure that your task does not require user's input. As the task is executed on the hidden desktop, no user will be able to communicate with it. Hidden task will start on the hidden desktop transparently for all logged on users. So the task will start always on the hidden desktop no matter what user is logged on and working on the system. The "User accounts (All users only)" options on the "User Account Options" tab of the Task Properties window are ignored.